In Saxon times, a church had already been established on this site close to the river Wensum. In 1188 the building was substantially rebuilt, and again in 1394, after the end of the Black Death, St Gregory’s was enlarged to its present structure. Worship at St Gregory’s thrived until the mid-20th century when the membership of the church was in terminal decline. In 1971 – the year Martin Wyatt opened Head In The Clouds around the corner in Pottergate – a note was pinned to the front gate of St Gregory’s declaring the church to be closed and all services transferred to St Giles Church on the Hill. 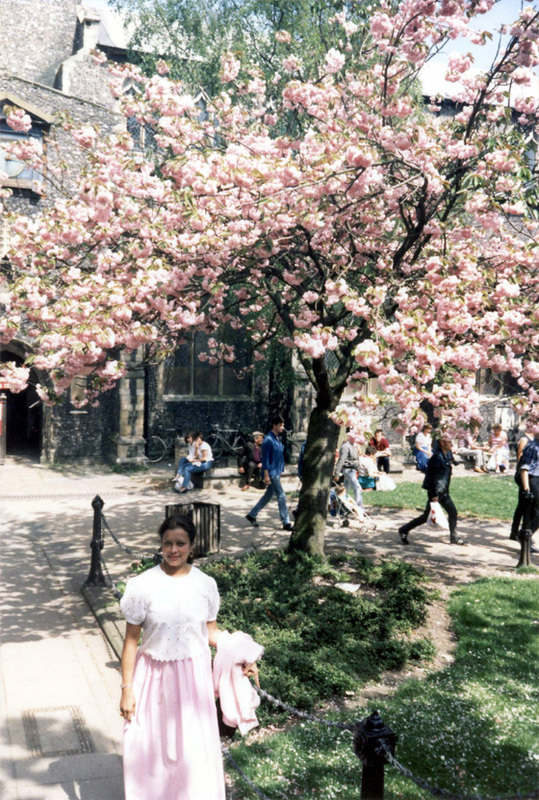 In early spring, 1973, Martin happened to pass by when the church gates and doors were open. He walked inside and was transfixed by the beauty of the church, its light, aura and serenity. Martin hurried back to Head In The Clouds to collect candles, and then approached the statues of St Gregory and Mother Mary, lit candles in their honour, and said prayers at the high altar. This was to be the start of a spiritual commitment that was to deepen in the years that followed. Later that year, Martin travelled to India. During that journey, he had a series of dreams of transforming St Gregory’s into a community venue where the worship of God could be inspired through classical music supported by theatrical techniques of lighting, movement and costume. 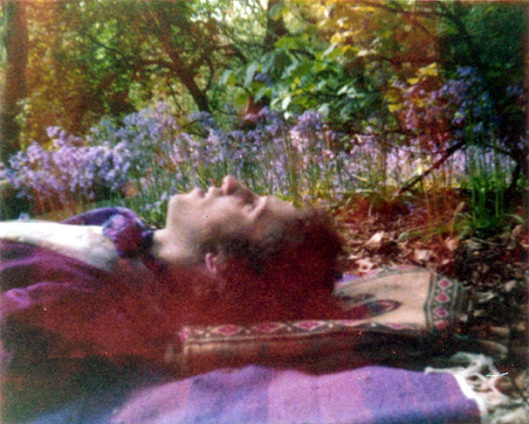 In the dreams he was also shown the techniques of leadership, and the basic approach of providing an environment where creativity can flourish and where people can share in the communal artistic process. 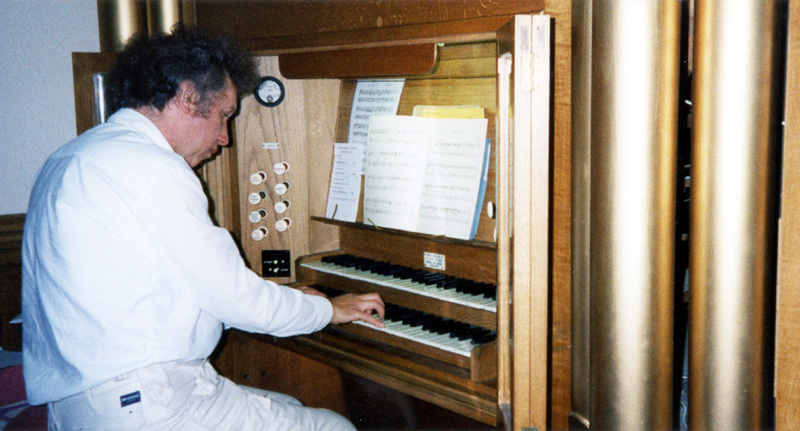 On his return to England, Martin borrowed the keys from the Church wardens and set about the task of cleaning the building, supplying it with electricity and then forming a meditation-based choir – The Voice Of Change – to perform great classical religious works in the inspiring setting of St Gregory’s. Thereafter, the creative process, community growth and use of St Gregory’s increased with dedication and enthusiasm. 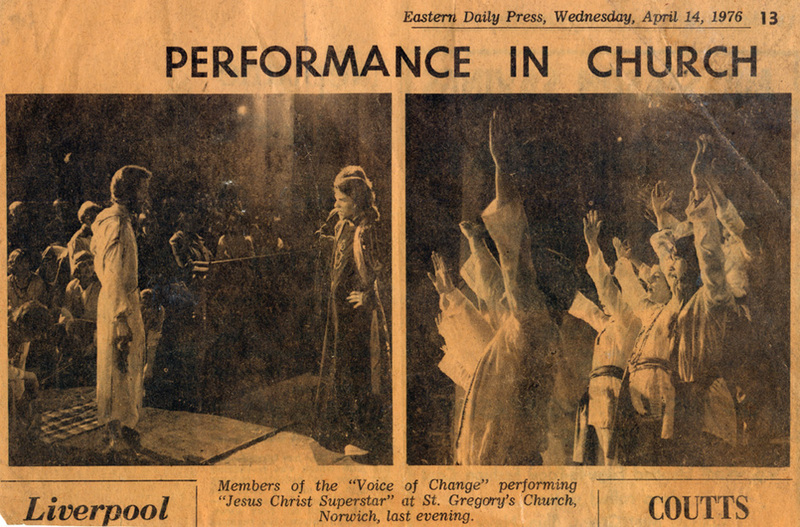 Regular concerts, shows – notably Jesus Christ Superstar – and services took place. 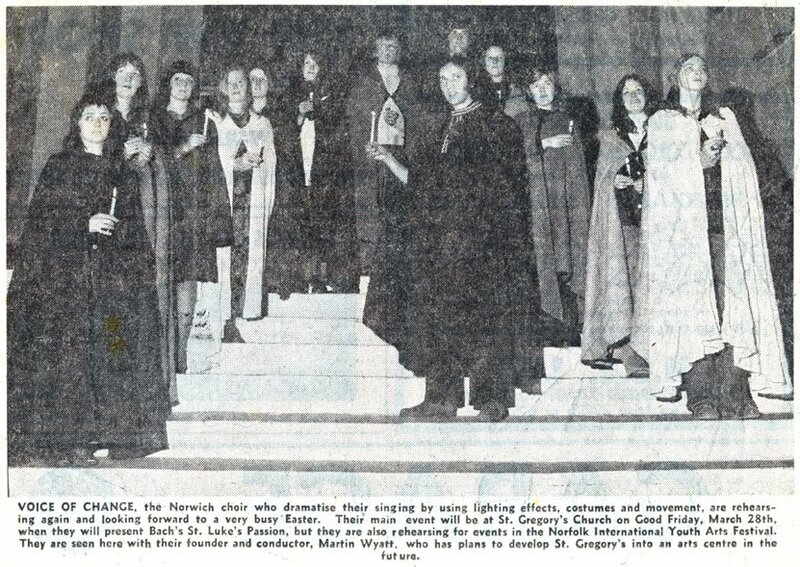 The Reverend Norman Moorhouse took the Friends of St Gregory’s under his wing; John Ince renovated the organ; Margaret Ashcroft, Daphne Basset, Win Forster and Joy Hubbard formed a loyal back-up team, and Martin’s wife Heather Wyatt gave constant support as piano accompanist and poster designer for many events. Andrew Piersenne, who later became a guiding light to St Gregory’s Trust, arranged Sing For Pleasure Festivals, featuring his youth choir – the Melody. St Gregory’s was alive again – with light, spirituality, music and friendship. In 1975, St Gregory’s Church was formally declared redundant. 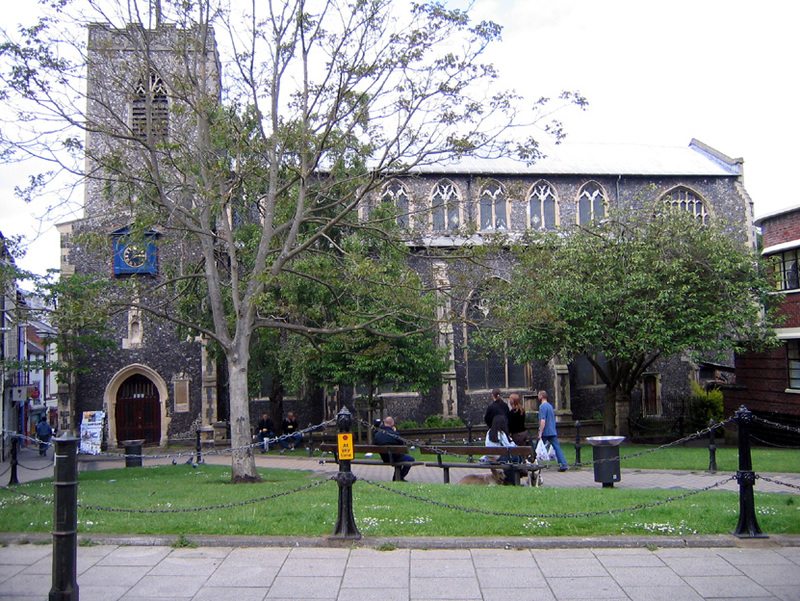 The building was transferred to Norwich City Council, which, in turn, established the Norwich Historic Churches Trust to manage the several redundant churches. Norfolk Museum Services had long hoped to open a Costume Museum in Norwich to house their extensive and valuable collection. St Gregory’s, close to Strangers Hall, seemed an ideal venue. The scene was thus set for a long struggle for the community of St Gregory’s. At the end of 1977, despite much protest, St Gregory’s was closed, its locks changed and community use prohibited. The Friends of St Gregory’s continued the campaign to prevent a costume museum taking over their beloved church, and eventually, in 1983, this scheme was halted by the Royal Fine Arts Commission. CHANGES AT SAINT GREGORY’S: 1. Saint Gregory’s in the 1950’s. 2. Declared Redundant! 3. New Front Doors donated by TSB. 4,5. Medieval door restored. 6,7. North door replaced. 8,9. Pews removed, new floor laid and exhibition boards installed. 10,11. Stairway discovered between vestry and undercroft. Both rooms restored. 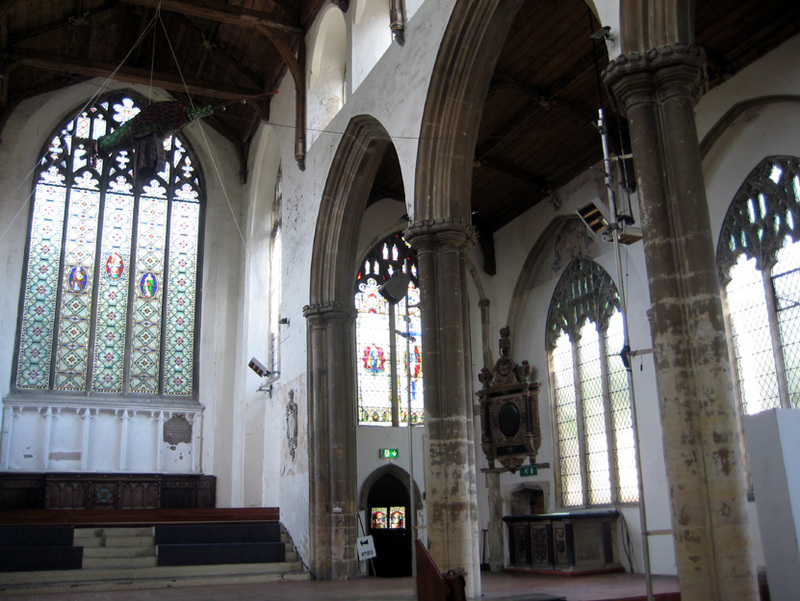 The St Gregory’s Society were told by Norwich Historic Churches Trust that they would be permitted a lease on St Gregory’s Church if they established themselves as a charitable trust and undertook to run St Gregory’s as a secular arts centre taking responsibility for upgrading the building to 20th century standards. 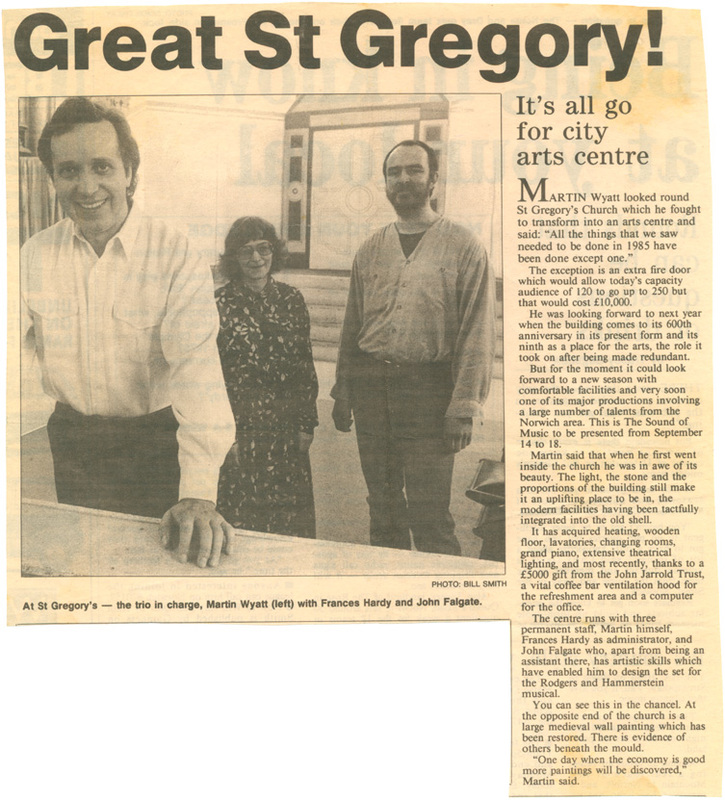 Many meetings later, all the hurdles were overcome and St Gregory’s reopened on St Gregory’s Day, Tuesday 12th March, 1985, as a Centre for the Arts. 18 years of creativity, community music-making, yoga groups, exhibitions, concerts and shows followed; always high on imagination and low on budget, the Centre thrived largely due to the hard work of the Administrator, Frances Hardy, and the enthusiasm and generosity of Martin Wyatt. Sadly, the Norwich Licensing Officer imposed an unrealistic capacity of 100 on St Gregory’s and the Norwich Historic Churches Trust announced closure in spring, 2003: a sudden end to the community use of this fine building. Its community robbed of a city treasure, this lovely church – a “haven of music, peace and tranquillity” – was to be left unused again for four years until a remarkable reopening under new management in May 2007. 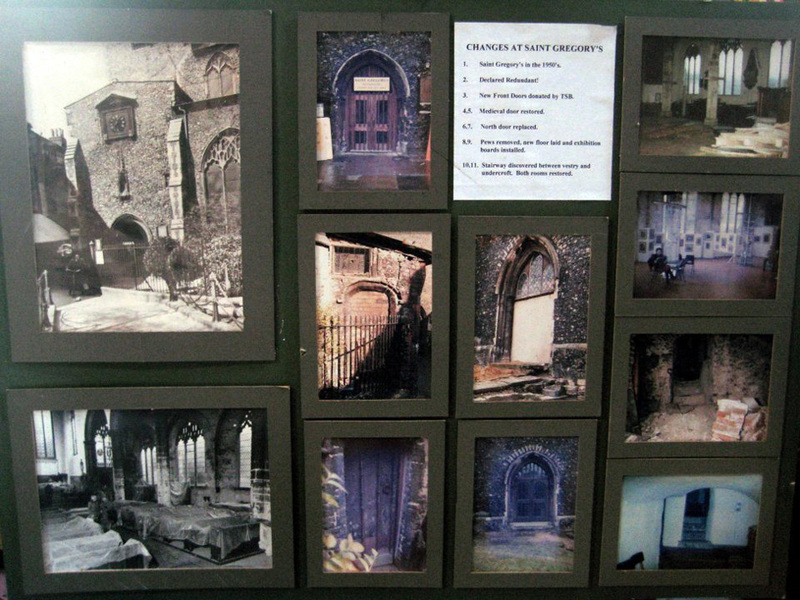 St Gregory’s Church came alive again as an important cultural venue at the heart of the burgeoning Norwich Lanes district. The renamed St Gregory’s Centre for the Arts was a charitable organisation which aimed to make arts, crafts and music available to all. It was the home of Railing Art, run by Rosamunde Woods, who used to sell art hanging from the railings of St Giles Church. 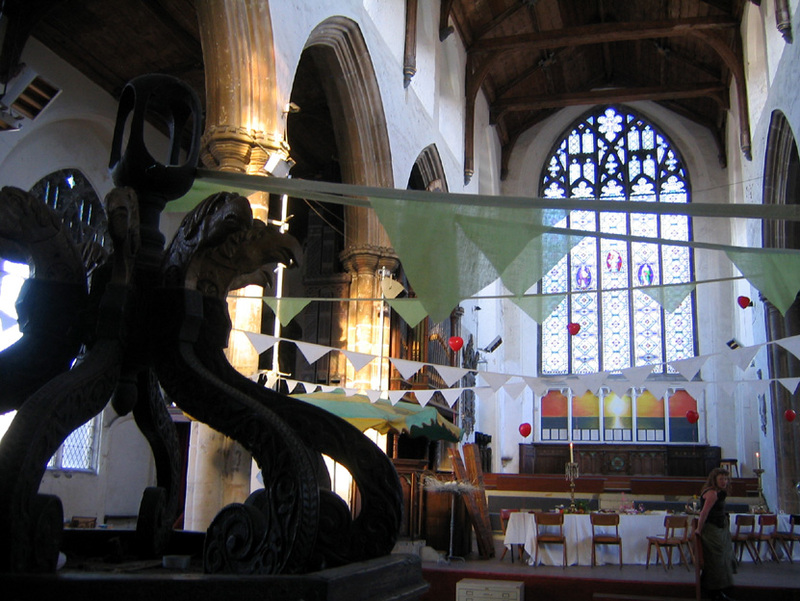 St Gregory’s transformed – a dragon was suspended from the ceiling, a bohemian array of instruments appeared for free usage, including several pianos; eggs, sweets, amazing cakes, tea and wine went on sale; a library of books grew and grew, and a large gazebo was erected to retain heat during the winter. A huge range of locally produced arts and crafts were exhibited and sold, a number of stallholders returned weekly for popular bric-a-brac, artwork and vintage clothes sales, and a great many events took place including fêtes, fashion shows, beer festivals, wine tastings, drum circles, poetry, music concerts and art classes. After tremendous effort for the community by the tenacious Rosamunde Woods and her friendly team, due to mounting costs and exhaustion, the keys were returned to the Historic Churches Trust in September 2012, and the Church once more became dormant. The latest tenants are St Gregory’s of Pottergate Antiques & Collectables who opened on 31st August 2013 – an offshoot of the Fakenham Antiques Centre, offering space for a number of dealers and curios – with fine furniture, retro clothing, jewellery, ornaments, vases, lamps, paintings and prints. 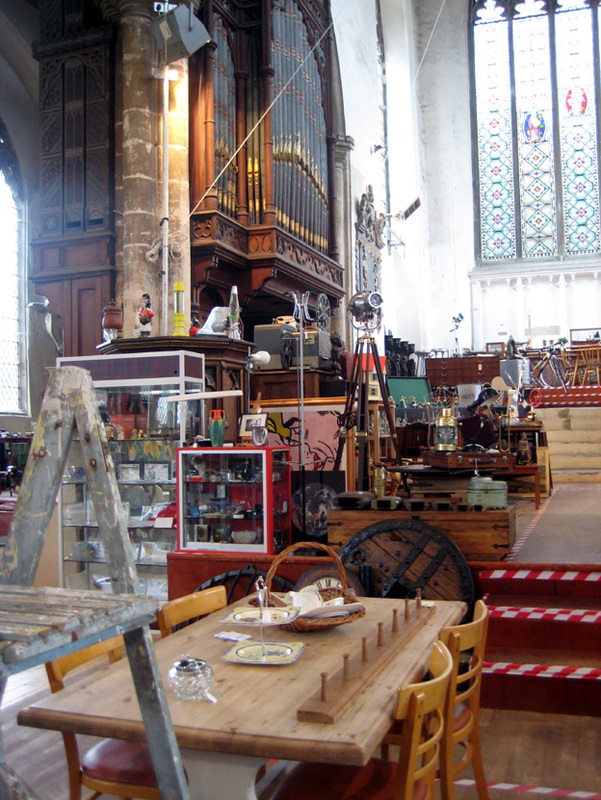 Business partners Robin Ebbage and Robert Charles have taken on a 10-year lease for the church, with already over 30 traders sharing the space, and plans for lots of special events and involvement in local festivities. 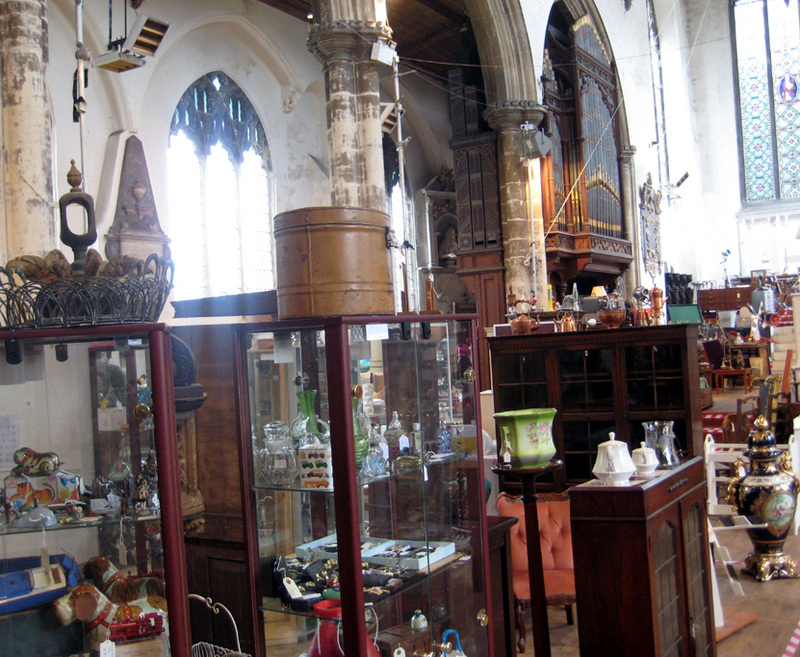 The antiques centre is open 10am-5pm weekdays, 10am-6pm on Saturdays and 11am-4pm on Sundays. For more information, see the St Gregory’s Antiques & Collectables Facebook page and this recent article on the Evening News website.